Small beaded bracelet on white leather. It has 15 row of beads and in a wave design and is approximately 5/8" wide. 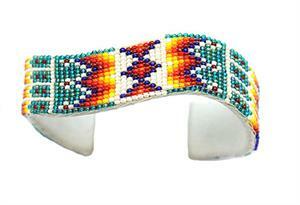 It is Navajo hand crafted by Francis Stewart. Colors and patterns will vary.